Free movement of people is the logical corollary of free moment of goods under free trade. These are both two sides of the same poisonous free market coin. If you think one is bad, you have some explaining to do about why you don’t reject the other too. Simple. Immigration positively affects the wages of the members of the professional classes due to the existence of effective trade guilds. Free trade negatively affects the prices paid by the members of the professional classes. Both immigration and free trade wreck the wages of workers -- although free trade is almost certainly the worse offender. You can usually understand a person's opinions on these matters as pure questions of class interest. And yes, that goes for cultural lefties too. I agree with you Illusionist. Dean Baker brings up this point quite often, that the United States practices selective protectionism. Baker mentioned this selective protectionism in a recent blog article. Really I don't know where I positioned. I tink that is a question of details. I can't be totally opposite against free trade, nor completely in favor of it. I'm completely against the euro, an economic aberration. This aberration is based on the idea that we are rational (not human) and more trade means less war. That has some sense. But free trade + free migrations destroy cultural base of democratic country. I'm with Larry Summers (thttp://www.ft.com/cms/s/2/13ab4e9a-5b15-11e6-9f70-badea1b336d4.html#axzz4GjLTkmNQ) hat growth is the best distributive policy. Not so hard. The arguments for free trade about the efficient allocation of resources (such as capital and labor) in so far as they apply to workers, apply to their *labor*. Immigrants bring more than their labor with them. An extrme example: If all prospective immigrants were made of anti-matter then the effect of their arrival would be quite deleterious, yet this effect was omitted from the efficiency arguments of the economists. again assuming full employment (of all means of production) at all times and constant returns to scale to all industries is ridicouls unless you are detached from the real world. Are there any conservatives who support free trade and oppose mass immigration? I can't think of one off the top of my head, but I'm sure they exist. They must be a very small group these days, although there were more of them in the past. 90's Peter Brimelow and 60's Enoch Powell, for example. The paleocons oppose both policies, mainstream republicans and cuckservatives in Western European nations support both. 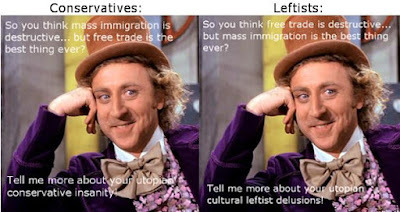 There are plenty of leftists who oppose free trade and support mass immigration (which as you note, is wildly inconsistent) but centre-left parties, such as the U.S. Democrats or the pre-Corbyn Labour Party both supported free trade and mass immigration. The centre-right and centre-left are indistinguishable on these issues, as they are on most others. The nationalist right is the only part of the political spectrum which consistently opposes both free trade and mass immigration. and the Old Left, which is what guys like LK are trying to revive. 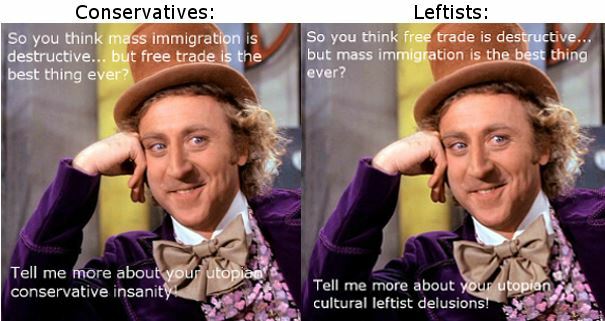 "Are there any conservatives who support free trade and oppose mass immigration?" Of course e.g., UKIP types. LK: UKIP support immigration at 50,000 net per year, which equates to about 350,000 migrants gross. 350,000 new people migrating to Britain every year is mass immigration by my definition, although the term "mass immigration" is obviously very nebulous. Septeus7: Pat Buchanan is one of the most prominent trade protectionists I can think of and he favours an immigration moratorium. He is the rightist most associated with "paleoconservatism", so he's neither a free trader or a mass immigrationist. Free trade + immigration restriction = a small group of conservatives? The 1st thing the guy says is the last thing I agreed with: That Trump seems to waffle a lot. After that, the guest commentator tends to drive off into the ditch! Dumping corporate trade agreements like TPP or TTIP is fine. They are the road to corporate tyranny. One is a social and cultural debate, and another is an economic debate. Chinese televisions do not require British schooling, healthcare, and protection. (1) Immigration more than just alters the labour supply, it changes the demographics of the nation. It wouldn't be an exaggeration to say that the demographics of the nation is the base upon which the superstructure of culture and law is based. The demographics of the nation strongly affects what sort of policies are put into place, the level of corruption etc. If you want to phrase it in libertarian terms, it is not a purely voluntary thing. Who is in the same political unit as me affects me in highly non-voluntary ways. The citizens therefore have a strong interest in controlling who is let in. (2) There may be quite considerable "psychological" externalities. It has been thoroughly documented (see Robert Putnam) that "diversity" leads to people being less engaged in their communities and less satisfied with their lives. In principle (though I have never seen it done, for obvious reasons) you could estimate the "externalities" of diversity by looking at the incidence of white flight and the cost of moving neighbourhoods, applying the assumption of revealed preference. My intuitive guess is that these externalities would be much larger than any gains from specialisation and trade that you'd expect from immigration. As I have heard others put it, there are liberty costs to certain kinds and levels of immigration. How can white flight in u.s. neighbourhoods be a consequence of mass immigration ? Is it not an aftermath of mass slavery 200 years ago, the way it ended, the racial divide etc. ? As non voluntary interactions are concerned, it is not as clear as SL implied. For example, take two girls born in a poor country. One of them stays in the place she was born, gets marrieds and carries 6 to 8 children who happen to destroy the local rain forest for a living. The other one comes to France receives some education and professional training and has one or two children. The three of them are not unlikely to then get usefull jobs (like taking care of old people). Who then affects me in the lesser voluntary way ? (BTW we allways have non voluntary interactions with other especially in a "full world" like ours, that's why clever big government and planning (e.g. family planning, universal education and healthcare) strengthens personnal freedom - contrary to the libertarian tenets.